Dare to be your best. In BCD’s Middle School we believe…. Every school should be a safe place for students and teachers to thrive together, and we see safety as far more than just a secure campus. At BCD, students can feel safe to take risks and be themselves. With changing brains and bodies, middle school can be a challenging time in students’ lives, and our community of friends, teachers and parents are here to provide united support each and every day. We work to engage young minds and develop the skills of “failing forward” and learning from our mistakes. Respect yourself. Respect others. Take responsibility for your actions. That’s the BCD motto, and it holds special meaning to our students as they grow into young adults, good citizens and the best versions of themselves. As part of our character development curriculum, all middle school students are assigned an advisor with whom they meet with daily to learn how to navigate academic and social issues with confidence and kindness. Additionally, we follow the Developmental Designs for Middle School (DDMS) curriculum as a framework to effectively blend social and academic learning. All BCD middle school students participate in the IB Middle Years Programme (MYP), which centers around local and global awareness, challenging students to inquire into a wide range of exciting topics and draw links between the classroom and the outside world. Students build confidence in their skills by thinking critically and creatively to solve problems in new ways. The MYP also helps our Bulldogs build a strong sense of self and understand who they are so they can emerge as respectful, responsible members of their communities. BCD middle school is founded on strong academic preparation balanced with life skills that will help our students excel in high school and beyond. Our well-rounded curriculum includes lessons in self-awareness and self-advocacy, as well as study skills in writing, research, organization, time management, and life skills needed for the transition to high school. Students also write a personal mission statement and focus on how to carry it forward with them regardless of the type of high school they attend. BCD Bulldogs love school, and our teachers, faculty and staff are dedicated to making our campus a place that fosters fun and inquiry in equal measure. Our unique and beautiful Boulder location sets the stage for learning that reaches outside the classroom into nature and the world. BCD is where education is engaging, hearts and minds are open, and inspiration is all around us. 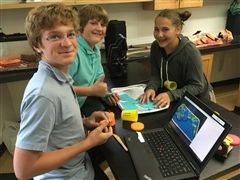 BCD’s Middle School offers an innovative, challenging curriculum that balances rigorous inquiry into core academic subjects with in-depth pursuit of students’ interests in the Arts, Health and Physical Education, and Design/Technology. The program presents students with age-appropriate challenge in a nurturing environment that cultivates independence of thought, habit, and mind. BCD’s middle school program not only meets the diverse needs of our students during these critical, middle years, but also provides excellent preparation for Advanced Placement and International Baccalaureate high school programs. Watched carefully and guided by skilled, experienced teachers, our graduates are well prepared for success in any quality high school. Knowing that the world needs well rounded learners, the Middle School also invites students to explore competitive athletics, student government, clubs, and after-school programs to round out their development as citizens of our community and the world. 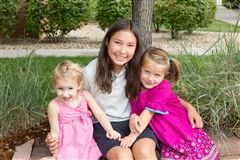 The Boulder Country Day Middle School is an authorized International Baccalaureate Middle Years Program. The IB Middle Years Program (MYP) emphasizes intellectual challenge and encourages students to make connections between their studies in traditional subjects and to the real world. 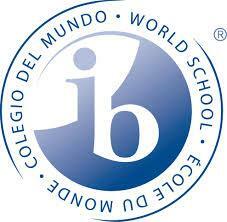 The IB program fosters the development of skills for communication, intercultural understanding, and global engagement, qualities that are essential for life in the 21st century. As part of BCD’s Middle School curriculum, 8th grade students complete a Capstone Project. Capstone Projects are a yearlong experience that encourages students to dive deeply into a subject of personal passion. This experience develops in-depth learning in the presence of an experienced mentor. 8th grade Capstone projects are a culmination of students' BCD experience bringing together the key elements of passion, innovation, and service. It is always exciting to see the range of interests and directions the students take. Student projects each year range from art installations, to designing head bands for a cure, to piloting a plane, to stage fighting. The Middle Years Program (MYP) is an internationally acclaimed educational program that supports BCD’s Mission and underscores the four tenets of BCD’s Philosophy: Rigor. Relationships. Relevance. Responsibility. The MYP exhibits the characteristics of interdisciplinary teaching and learning, favors a focus on concepts rather than merely on content, and provides a rich, inquiry-based model of introducing and exploring concepts within and across the disciplines. The MYP’s focus extends beyond the notion of knowledge as an accumulation of content to include connectedness in learning and the big ideas that bind people and civilizations together. The learners that emerge from our program are well-prepared for today’s world, which is information-filled, fast-paced, and demanding of 21st century skillsets such as communication, collaboration, critical thinking, and creativity. FAQ document for parents on the MYP. Middle School can be a challenging time for adolescents. Choosing the right school for your student during those years can have a big impact on who they become. Need some help determining what is most important to you and your child? Download our 10 Questions to Ask When Visiting a Middle School worksheet. The BCD travel program creates trips tied to curriculum that enhance our IB education and allow BCD students to discover and embrace their excellence and expand their horizons through unique experiences. This April we have two great trips running. Boulder Country Day has intentionally chosen to focus on preschool through eighth grade and we believe it is among our greatest assets. We firmly believe that a PS-8 school environment offers distinct advantages during the most critical years of a child’s intellectual, social, and emotional development. 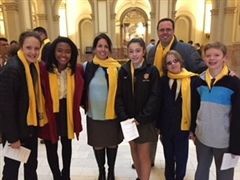 Boulder Country Day School middle school students and faculty joined eight other Colorado private schools at the Capitol for a Civics Day on Wednesday, January 23rd as part of School Choice Week. 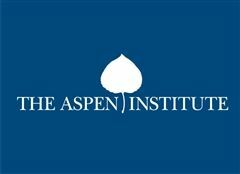 Thanks to the generosity of Christy and Jay Orris and their commitment to faculty professional development, I recently had the opportunity to attend the Aspen Institute Executive Seminar in Aspen, CO.
BCD MS STEM and Programming teacher, Phil Mayhoffer, has been selected to participate in the first cohort of the US LEGO Education Master Educator program. The program which is designed for educators in early learning through secondary school who currently use LEGO hands-on learning solutions in their classroom. The selected participants embody the LEGO Education mission of enabling success for all students through hands-on learning experiences. Mr. Mayhoffer instructs several after school Lego courses, as well as, coaches a combined Fist Lego League team made up of students from Boulder Country Day School and the I Have a Dream Foundation of Boulder County (IHAD) (link to news story on First Lego League team). "I am super excited about this opportunity," says Mayhoffer. "I expect that my participation in the program will enrich the classes I teach at BCD and our FIRST LEGO League teams." Through an anonymous Diversity, Equity & Inclusivity grant by a BCD parent, Boulder Country Day School and I Have a Dream Foundation of Boulder County (IHAD) have partnered to form a combined First Lego League® (FLL) team. The grant funds transportation and course expenses for participating IHAD students and brings together students, technology, and BCD’s goal of inspiring students to reach their full potential. This year's Gala was a huge success. Thank you to all who participated! Students from the middle school student council joined thousands of other student leaders at a Leadership Experience and Development (LEAD) Conference in Chicago, IL on February 10th – 12th. BCD middle school students will be live streaming several sessions from this year’s CU annual Conference on World Affairs. If our Preschool and Elementary school divisions have been described by some as “magical”, then I can only imagine our middle school can be described as transformational. As part of BCD’s Middle School curriculum, 8th grade students complete a Capstone Project. Capstone Projects are a yearlong experience that encourages students to dive deeply into a subject of personal passion. This experience develops in-depth learning in the presence of an experienced mentor. 8th grade Capstone projects are a culmination of students' BCD experience bringing together the key elements of passion, innovation, and service. It is always exciting to see the range of interests and directions the students take. 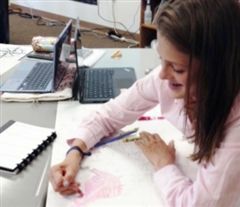 Student projects this year range from building ovens in Nicaragua, to designing head bands for a cure, to piloting a plane, to stage fighting. On April 22nd, our 8th grade students finished the hard work they have put into their Capstone projects as they presented their work to their families and mentors. Well done, Bulldogs. To see a complete list of this year's projects, click here. More on BCD's Middle School curriculum. In 7th grade we have introduced our novel study of The Call of the Wild by Jack London. Students are looking at narrative perspective as we read. By looking at point of view, students gain a greater understanding of plot details that are in (and out) of the story. By examining a certain scene from a different character’s perspective, students see characters in a new light, perhaps gaining empathy or a better understanding a character’s motives. Finally, by analyzing why the story is told from a dog’s point of view, students learn about the Klondike Gold Rush and human behavior from a unique perspective. How different the story would be if told from the perspective of one of the humans! We are finalizing our unit on Biomedical Engineering with a review of why 3D printing is such an important development in the world of medicine. They are using recent events in medical technologies and our classroom experience with 3D printing to communicate where the impact of 3D printing on the accessibility of prosthetics, surgical operations, and other areas related to health. As they communicate the current state of medicine, they are also catching a glimpse of where medical technologies will be taking us in the future. Thank you to Bob Radocy, owner of TRS Prosthetics, for coming and speaking to our students. Middle School students participated today in the annual Model UN exercise. Having done their research and prepared resolutions they came ready to serve as delegates for their assigned countries. As emerging global citizens, students connect current events to the study of delicate international relations and how conflicts are addressed through the United Nations. Gaining an understanding of the domestic and international concerns of a nation, as well as its relationship to its allies and other nations, gives students a greater sense of the complexity of foreign relations and the challenges we all face in the 21st century. So proud of our Spotlight Singers and Mr. Parker. They did a fabulous job singing the National Anthem at the CU vs. Utah game on January 8th. Well done Bulldogs. We are applying what we have learned about simple machines and mechanical advantage to designing and building our own candy-catapulting devices. 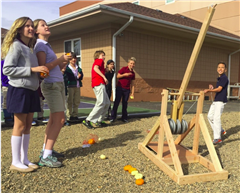 In preparation for building our own catapults, we have also spent a day celebrating fall by starting a tradition of Pumpkin Chuckin’ at BCD. Seeing how a larger catapult works will help us understand the need to transfer as much potential energy from the machine into kinetic energy in the projectile.